EDMOND — To say that Brent Gibson’s career in home design has been a family affair would be to get it exactly right — from the business itself to product and legacy. Daughter Nicole, as a child, tagged along to job sites when her dad was a homebuilder in Colorado briefly in the 1980s. 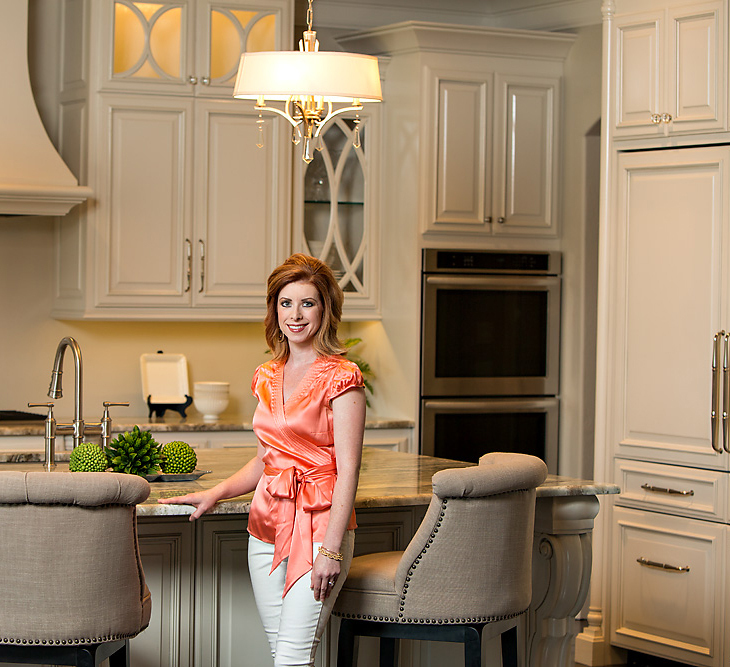 Now she and her husband, Shane Rickey, work for Brent Gibson Home Design. She is an interior designer. He works with clients and builders in plan and home selection. Daughter Natalie is a mortgage lender with The First State Bank, with an office nearby to her dad’s business at 415 W 15th St. Her husband, Ryan Francis, is a real estate agent with Keller Williams Elite in Oklahoma City. After 25 years, the architectural legacy of Brent Gibson Classic Home Design is in plain view. It can be seen in newer Nichols Hills, in Edmond’s Oak Tree and Iron Horse Ranch Estates, among many others, and in northwest Oklahoma City’s Muirfield Village, just-underway Camden Park and other neighborhoods where Gibson is the sole designer. It is literally on display in Rose Creek, where Nicole and Shane Rickey’s home at 3325 NW 175 is a working model. Their 1 1/2-story, 4,427-square-foot home is in the style of a Normandy French chateau — and it’s that aspect of Gibson’s legacy that is most important to him: lines that please the eye as well as connect to the vintage past. Consider the Rickeys’ home. The turret entry is the focal point. Pale blue-gray shutters help bring out the light stucco and stone. Four cast-stone fireplaces designed by Nicole help anchor the mostly open interior. Inside, he said, the influence is seen in “arches everywhere,” the ceiling dome in the master bedroom, the shape of the staircase and the design of cabinetry. The home also is firmly in the here and now, he said. It’s a smart home, with systems operable by cellphone from “anywhere in the world.” A mother-in-law suite has its own single-car garage and separate entry. Like the company, the design of the home itself was a family thing, Nicole Rickey said. It’s that kind of thinking that makes the Rickey home a model home and not just a display of products and design technique. Function, and how it relates to form, can be explained from a family perspective. For example, Shane Rickey pointed out the line of sight from where he lays his head at night, through the door of the master bedroom, across and up the stairs — to a doorway where their youngsters can get a glimpse of their parents if need be. They didn’t want the girls to feel far away. Then there’s the kitchen, with its huge island, walk-in pantry and complex of cabinetry. Gibson, 59, said he never dreamed he’d have his own business for a quarter-century, and something to leave for his children. To have designed a home for Toby Keith. And pro golfers Bob Tway and Scott Verplank. And Oklahoma State Cowboys football coach Mike Gundy. And most recently for Kevin Sumlin, football coach for the Texas A&M University Aggies. Nothing like that seemed possible when Gibson moved to Edmond in his 30s after the stint in Colorado, which came after a decade of working in Weatherford melted away with the 1980s oil bust. What seems likely is that demand for his approach to home design is as solid as his dedication to classic architecture adapted to clients’ lifestyles. Original Article written by Richard Mize of NewsOK.com Republished by permission.